Apps, apps, apps… apps are everywhere. Every company wants to have their own custom mobile app. Does it make sense though? Do you really need your own app? Let’s dive into this topic and find out. We should start with some data analysis. According to statistics from PocketGamer.biz , only in 2016 there were more than 900k apps submitted to iTunes App Store. On the chart below we compared a number of monthly app submissions in 2015 and 2016. As you can see, the number increased nearly 50% in a year. Pretty impressive… and scary. This huge popularity means few things. First of all, the world is going mobile and it’s not going to slow down in the nearest future. Second of all, the competition is extreme. Third of all, your app has to give enormous value to the user, otherwise he’s not going to use it and your app will fall into an abyss. So how do you decide if your small business, startup or enterprise needs a custom mobile app? Let’s go step-by-step, shall we? You need to sit down and think if your business target audience even uses smartphones? If you’re selling jet fuel to huge corporations or anti-aging cream to ladies 50+, what are the chances that they’re gonna use your app? We’ll try to guess and say they’re pretty close to the surface temperature of Pluto, which is -240 Celsius, only 33 degrees above the absolute zero. On the other hand, if you have a business that targets 13-18 years old, there are much higher chances of having a successful app. You have to understand that developing a mobile app, preferably for both platforms (iOS and Android, forget about Windows Phone, it’s market share has dropped down to 0.3%), is not the cheapest thing in the world. Therefore you need to assess if a potential value you could get out of having an app, is comparable to the amount of money you have to pump into its development. Decided to go for it? Please fasten your seatbelts and prepare for a long and interesting ride. Houston, we are ready! 3...2...1…IGNITE! What’s the main reason you want to have an app? Do you want to use it to help you build a brand awareness? Or you want to use it to sell your products? Or maybe you want to create a community around your business? What kind of functionality you’d like it to have? How you’d like it to look like? These are only some of the questions you have to ask yourself before starting to look for someone to build an app. By the time you decided what kind of app you want to have you hopefully realized that all that functionality will require some time to be implemented. And part of that functionality isn’t really that crucial in the very beginning (i.e. changing color themes for your app). This leads us to the next step - MVP. If you can’t code yourself, you’ll have to look for someone to develop it for you and you have few options. You either go to a freelance developer or hire a software house to do it for you (it takes us maximum up to 48 hours to create a working MVP). Which one is better in what situation we’ll try to cover in our next article. So stay tuned! After you went through all of the previous steps you have to analyze the results to be able to say if it does make sense to build a custom mobile app for your business. To help you make a decision let’s go through some pros & cons of having an app. Branding and awareness are very crucial for your business, especially if you’re just starting. Having an app gives you constant presence in front of your consumer’s eyes. Every time they'll go through their apps on the phone, your logo will always be there. 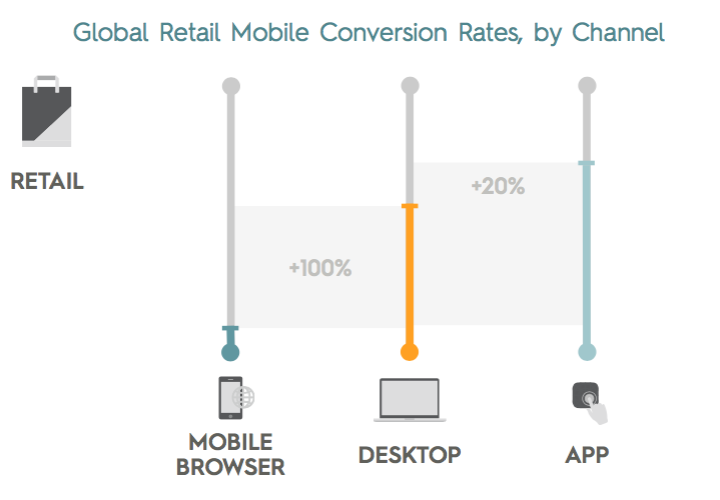 According to State of Mobile Commerce Report Q4 2015, mobile apps conversion rates were 20% higher than desktop and 120% higher than mobile browsers. There are few reasons for this. Better user experience in comparing to browsers (especially mobile) and better control over customer decision-making process are one of the most important ones. Mobile becomes a go-to platform for more and more people. 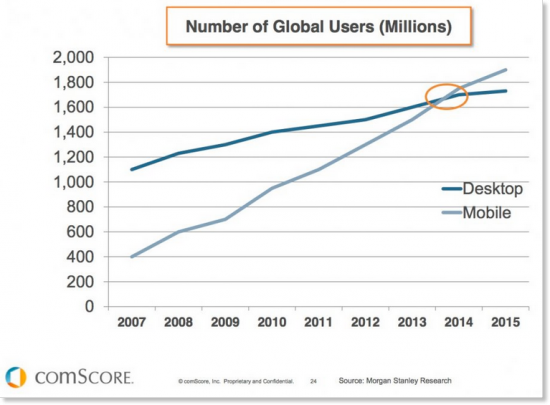 According to comScore research, number of global mobile users overtook the number of desktop users in 2014. Considering the fact that the mobile apps market is growing and yours especially bigger competitors, such as huge corporations, are very slow on implementing new tech, being first can be a game-changer. You need to understand that having a mobile responsive website doesn’t mean you’ve done everything to reach out to people using their smartphones or tablets. 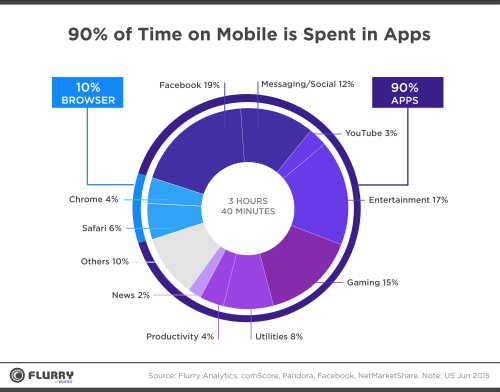 90% of the time they spend staring at the screen is actually spent in apps and games, not in a browser. Being present in your customer’s phone can help you to establish more meaningful relationships with them. You can talk to them, get their feedback and reach out to them when they actually might need you by sending them a push notification when they pass by your office or shop. As we mentioned before, building a great mobile app requires a lot of money and time. And it doesn't stop right after you've completed the app. An app requires to be constantly updated and new content added. Otherwise, it won’t live for a very long time. Taking care of bugs and security issues also should be considered when planning the budget. Each day bring us even broader selection of different apps. Which means it’s harder to attract customer’s attention. If you create a product that doesn’t give value to them and doesn't stand out, it’s going to be forgotten few days after it’s release. These simple steps will help you to identify if your business already reached the stage when you need to building a custom mobile app. It might turn out that you indeed should have one, but just a bit later, or maybe it doesn’t make any sense to invest in such a solution at all. At the end of the day, the decision is yours. Think it through very carefully! If you have any questions, feel free to ask in the comments below or by emailing us @ hello@morefromit.com. Will be more than happy to help you out!